What Was The Transfiguration About? 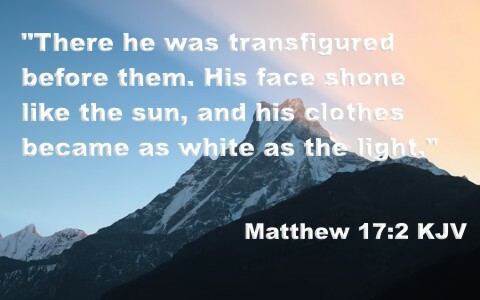 What was the Transfiguration all about? Why did Jesus show the three disciples Moses, Elijah, and Himself in their glory? When Jesus took Peter, James, and John up to what is called the Mount of Transfiguration, He revealed Moses and Elijah to them, and the interesting thing is that Jesus didn’t have to introduce them or tell the disciples who these men were. They already seemed to know who they were, so how did they know? Why did Jesus bring the disciples up the Mount to see this glorious transfiguration? Perhaps Jesus wanted them to know that God is still the God of the living and not the dead (Mark 12:27) or He wanted them to know that after death, the saints of old are not gone nor forgotten, but still actively participating in the kingdom of God, but surely Jesus wanted them to see His glory and to confirm to them or remove any doubt that this was the very Son of God and God Himself and the Shekinah glory that they saw Jesus in was like that of God in the Old Testament. The way Moses’ face shown after He had been with God is the same God that Peter, James, and John had seen. This is Jesus, Who was that Rock in the Wilderness and “all drank the same spiritual drink. For they drank from the spiritual Rock that followed them, and the Rock was Christ” (1st Cor 10:4), which is the Apostle Paul’s reference to the time when “Moses lifted up his hand and struck the rock with his staff twice, and water came out abundantly, and the congregation drank, and their livestock” (Num 20:11). Elijah was one of the Old Testament prophets, and as Moses represented the law of God on the Mount of Transfiguration, so Elijah represented the prophets. When Jesus brought Moses and Elijah to the mount, He was revealing that the law, in particular the Mosaic Law, and all of the Prophets, who long ago prophesied of the coming Messiah, and both of these pointed to Jesus. The Mosaic Law foreshadowed the coming work of Christ while the prophets pointed forward to the coming anointed one of God, Jesus Christ. These two, the law and the prophets, both focused on the redemptive work of Christ and the law in particular, showed us the impossibility of saving ourselves by works of the law. Jesus told the religious leaders, “You search the Scriptures because you think that in them you have eternal life; and it is they that bear witness about me” (John 5:39), but even with this obvious teaching that Jesus is the Christ or the Messiah, He told them, “you refuse to come to me that you may have life” (John 5:40). How sad that they knew the Scriptures but were blinded by their jealousy, because even Pontius Pilate knew that “For he knew that it was out of envy that they had delivered him up.” (Matt 27:18). Even to His own followers “he said to them, ‘O foolish ones, and slow of heart to believe all that the prophets have spoken’” (Luke 24:25)! After Jesus resurrection, He explained to them why He had to suffer and die, and so “beginning with Moses and all the Prophets, he interpreted to them in all the Scriptures the things concerning himself” (Luke 24:27). Notice how the “Scriptures” testify of Him, “beginning with Moses and all the Prophets.” That may explain why Moses and Elijah were with Jesus on the Mount of Transfiguration. As I said before, Jesus Himself said, time and again, that the prophets testify of Him but He also said Moses did too, but where is this found in Scripture? We read in Deuteronomy 18:15, where Moses wrote that “The Lord your God will raise up for you a prophet like me from among you, from your brothers—it is to him you shall listen” and so “I will raise up for them a prophet like you from among their brothers. And I will put my words in his mouth, and he shall speak to them all that I command him.” (Deut 18:18). Obviously, this is speaking of Jesus Christ because it says, “whoever will not listen to my words that he shall speak in my name, I myself will require it of him” (Duet 18:19). Clearly, when Jesus brought the gospel of repentance and belief (Mark 1:15), people would reject it, but for everyone who rejects Jesus Christ, God says, “I myself will require it of him.” Will we listen? Will others who are still lost listen? Whatever the case is, Jesus tells us what the state is of those who believe and those who reject Him, as He said, “Whoever believes in the Son has eternal life; whoever does not obey the Son shall not see life, but the wrath of God remains on him” (John 3:36). God is always interested in glorifying the Son of God and so should we, so this might be part of the reason Jesus appeared in the Shekinah glory of the God of the Old Testament. He wanted to make clear that He is much more than a Man. He is the God of glory and we need to ascribe to Him the very glory, honor, and praise that He is due. The Apostle John understood that Jesus’ glory was important and was an eyewitness of seeing “the Word became flesh and dwelt among us, and we have seen his glory, glory as of the only Son from the Father, full of grace and truth” (John 1:14). The Apostle Peter recalls the account in writing, “when He received honor and glory from God the Father, such an utterance as this was made to Him by the Majestic Glory, ‘This is My beloved Son with whom I am well-pleased’” (2nd Pet 1:17), and “When the disciples heard this, they fell face down to the ground, terrified” (Matt 17:6). After this, “Jesus came and touched them. ‘Get up,’ he said. ‘Don’t be afraid.’ When they looked up, they saw no one except Jesus” (Matt 17:7-8). After this, “As they were coming down the mountain, Jesus instructed them, ‘Don’t tell anyone what you have seen, until the Son of Man has been raised from the dead’” (Matt 17:9). Only later would they fully understand why Jesus wanted them to behold His glory as the Son of God. Here is something more for you to study: Who Where the Major Prophets? You did explain that through the Scriptures Jesus had revealed who He was to these disciples by referencing the Law(Moses) and the prophets(Elijah) but was that enough to make them realize who these individuals were? My guess has been that verse 3(just before Peter references who these OT saints were), speaks of Jesus talking with Moses and Elijah. My “fill in the blanks” guess is that Jesus embraced Moses and Elijah and greeted them by name. Peter simply overheard. Great point Doc. We know that they love the Lord and by this time they had been with Him for centuries, so you are right in the sense that they must have known each other intimately enough to embrace…but somehow, that is beyond me, I think they would have known anyway. I can’t explain why. Previous post: Who Are the Elect in the Bible? Next post: How Should Christians Settle Doctrinal Differences?